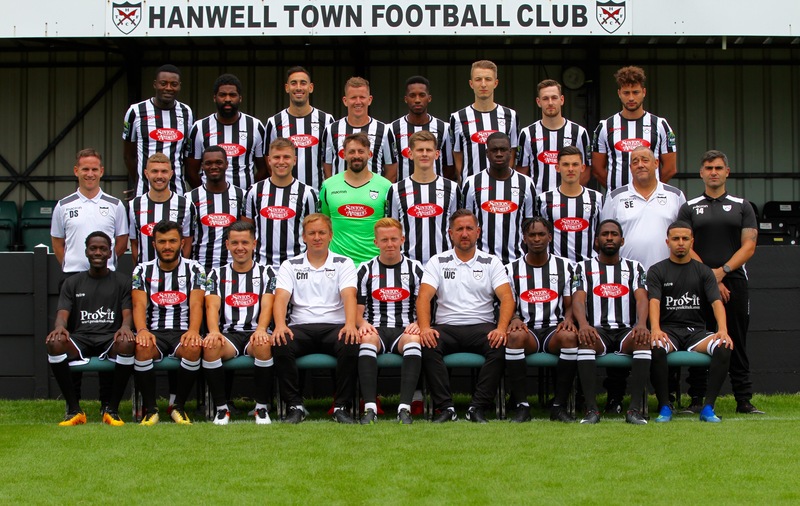 The three points earned in this Middlesex derby game moved Town above their vanquished local rivals into ninth place in the ‘South Central’. It was a strange game to watch with the ball spending long periods of time in the middle half of the pitch, both back lines keeping it out of shooting range. However, two bursts of goals in the first half sealed the result. The visitors had taken the lead as early as the fifth minute after Town had lost the ball in midfield. Kyran Worrell latched on to a pass from Alex Witham and played it to Zaied Abti, who fired the ball back across Aaron Bufton into the bottom corner. Hanwell were not to be dismayed and, three minutes later, a Jack Waldren corner was met perfectly at the far post by Dwayne Duncan and the scores were level. Straight from the kick-off Harry Rush won the ball and surged forward to encouraging shouts from the crowd but, disappointingly, dragged his shot wide. The following period saw Northwood having more of the ball than Hanwell but there was not another noteworthy incident until twenty-five minutes had passed when Aaron did well to stick out a foot to divert Jack Witham’s goal-bound shot past the post. The ensuing corner was swung in towards a forest of heads but Dwayne demonstrated his prowess in the air again, at his own end this time. Up the other end, Louis Bircham threatened the Woods’ goal after ‘keeper Caolan Doyle had mishandled but Imran Uche saved the day for the visitors with a timely interception. After thirty-five minutes a Northwood corner resulted in a sweeping, pitch length move by Hanwell involving Dwayne, Brian Testolin, Harry and Louis, but Woods recovered to block out any deserved end result. However, five minutes later, another sweeping move, this time involving Dwayne, Andy O’Brien, Louis and Gareth Chendlik was finished by Harry crashing the ball into the net. Just two minutes later, Gareth and Harry combined for the latter to chip the ball to Louis, who netted with a spectacular volley. The second half began with Harvey Killeen replacing the competitive Dan Julienne, who had been booked earlier, following a number of robust challenges. Within a minute skipper, Olly Duffy tried his luck from distance but was narrowly off target. Northwood then had a good spell of possession and Aaron was called upon to use his feet to once more deny Witham. Northwood’s Sabti then hit the cross-bar directly from a corner kick, and a driving run by Matt Cooper probably deserved more than the comfortable save by Aaron that was the end result. Dwayne was then called upon to divert for a corner a low ball into the box that had ‘goal’ stamped all over it. At this stage, Town were playing on the break and debutant ‘keeper Doyle did particularly well to race off his line to prevent Louis having a clear-cut chance. Gareth’s header then found Louis on the flank but his low cross came to nothing. A good, deep cross from Jack Waldren then found Brian but he headed wide, after which the Hanwell wide man was foiled by Doyle’s quickness off his line. Substitute Zaine Gangadeen’s clever backheel, after an exchange of passes with Harvey, then forced another good stop from Doyle. To their credit Woods kept going until the end Cooper went on a second drive forward, this time missing the target with a finish that did not match the run. Witham then shot narrowly off target. Well into added-on time the visitors went close again with Dan Newton heading over from close range. It was not Northwood’s day but they had paid the price for not working Aaron enough, despite plenty of possession. On the other hand Town made it thirteen points out of the last fifteen without looking entirely convincing. TEAM: 1.Aaron Bufton 2.Kieron Cathline 3.Jack Waldren 4.Olly Duffy © 5.Dwayne Duncan 6.Andy O’Brien 7.Dan Julienne (16.Harvey Killeen 46) 8.Harry Rush 9.Gareth Chendlik (15.Jerry Maja 74) 10.Brian Testolin (17.Zaine Gangadeen 80) 11.Louis Bircham. Unused substitutes: 12.Joe Mills 14.Jamie Calvin.